What About Cynics: Chapman gets Twitch and more. 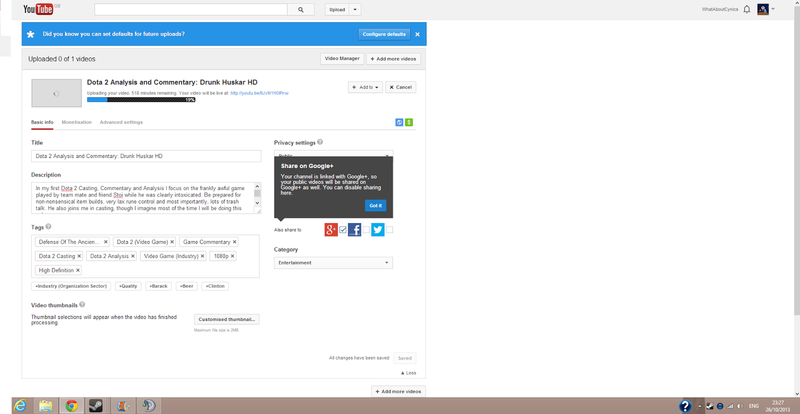 So this was originally suppose to be a double announcement, but apparently it is going to take another 524 minutes to upload the video I am uploading to Youtube ( Aaron finally edited and uploaded his own video, that is an announcement in itself, so the article on that will have to wait as I promised this would be up on the Saturday. So yeah, my computer will be hot tomorrow morning. I suppose that image sort of gives away what it will be about, but I'll put an article (that you are free to ignore) when it is done to explain my reasoning. Also, not every video I'll be making will revolve around the game that should not be named. I'm planning to do commentary playthroughs of such latest indie hit Papers, Please, top down neon-emblazoned beat-em-up Hotlline Miami and if you are really lucky, me struggling to play Football Manager 2013. So yeah, in a pretty related note, as it details me branching out more into videos and stuff (Don't worry, I'm keeping my article output at the same level). Trying to add more than just the podcasts and occasional joke video we put up on What About Cynics by adding gameplay, in addition, with the seeming victory of Twitch over the world of streaming, I've got myself a Twitch channel, so you can watch me play games as it happens, with all my hilarious commentary. (Warning, commentary might not be hilarious, nor even on, but when it isn't on, I'll put on my amazing music taste). Never say I don't apply the most effort I possibly could have to my projects. So yeah, here is my Twitch link, follow me if you have it. I'm going to put it on our list of buttons next to Twitter and Facebook. 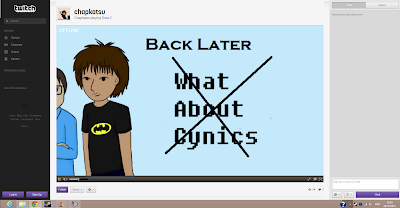 Speaking of which, the easiest way to get updates on what I'll be streaming is to check my personal Twitter rather than the What About Cynics one, which was operated by our former webcomic artist rather than myself. So that would be www.twitter.com/chapkatsu. Oh yeah, social media uniformity. That is how cool I am, I should really change my name on this to Chapkatsu actually...Food for thought. But yeah, watch me stream, that would be cool, I'll try and be funny, I'm willing to take requests rather than just Dota 2, hopefully I can make more easily digestible stuff for you guys, rather than walls of text or hours of podcasts (though boy do I love hours of podcasts, that won't cease by the way) . Lets see how this goes. Hope you stay tuned. (Hmm, my articles are getting short, hopefully after the poem I'll get to write a Harvey-esque essay that I always envy so). theoretical support is the 2nd best kind, I'll take it. If you change your name to Chapkatsu, I will change mine to Sugarplum Fairy. You have been told. This is a game of chicken which will result in us both losing. Your cynicasts have already made me miss a bus. I can see I'll get nothing done now. I saw that, terribly sorry. I had to harvest that weekend as well. I barely know what Twitch is, but I'll try to check it out. Look forward to any game that shows off your extensive knowlege of sport, a thing you are known for. Hopefully it will be funny in direct inverse to my football knowledge. You can get ointments for that. I've just been asked if I want to "go turbo". Is that like going commando only quicker? I believe going Turbo is paying to host a Twitch. It means you get placed higher up the page and can put a title on what you stream and stuff. Maybe one day I shall "go turbo".